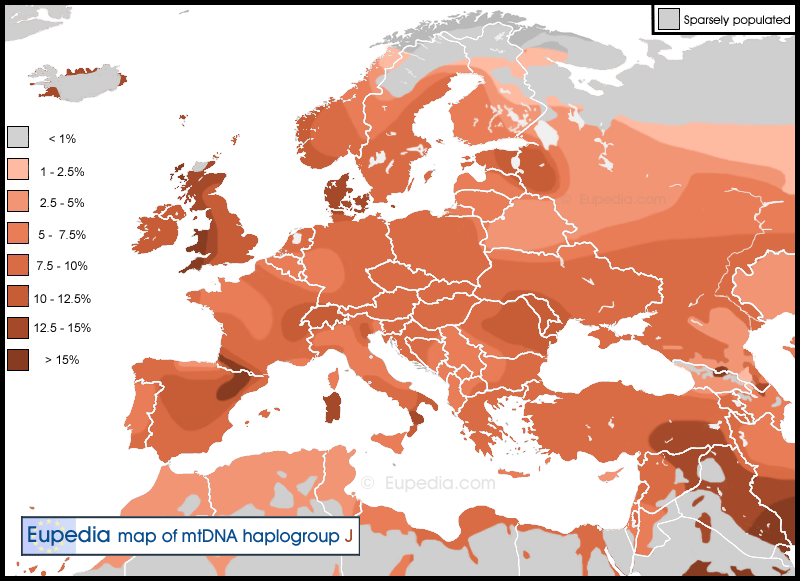 Haplogroup J is relatively evenly distributed across all Europe. The only population in which it is absent are the Saami from Lapland. The highest frequencies of mtDNA J in Europe are found in Cornwall (20%), Wales (15%), Iceland (14%), Denmark (13.5%), Sardinia (13%), Scotland (12.5%), England (11.5%), Switzerland (11.5%), the Netherlands (11%) and Romania (11%). In the Middle East, it is most common in Saudi Arabia (21%), followed by Kuwait (16%), Yemen (15%), Kurdistan (15%), south-west Iran (14%), Iraq (13%), and the United Arab Emirates (12%). Local peaks are also observed among some Caucasian ethnic groups, such as the North Ossetians (16%) and the Dargins (11%). The mutation defining haplogroup J is thought to have taken place some 45,000 years ago, probably in West Asia. It is estimated that J2 split first from J* around 37,000 years ago, followed by J1 some 33,000 years ago. Between the Last Glacial Maximum (c. 26,500 to 19,000 years before present) until the end of the last glaciation (c. 12,000 years ago), J lineages branched off in seven main subclades: J1b (± 23,000 ybp), J1c (± 16,500 ybp), J1d (± 20,000 ybp), J2a1 (± 16,500 ybp), J2a2 (± 20,500 ybp), J2b1 (± 15,500 ybp) and J2b2 (± 11,000 ybp). Note that the current nomenclature does not include any subclade called J1a anymore (the previous J1a was renamed J1b3a). Although no trace of mtDNA J has been found in Mesolithic or Palaeolithic Europe yet, it is likely that some J lineages recolonised Europe at the end of the glacial period from the Near Eastern refugia, as proposed by Pala et al. (2012). If that is the case, this migration would most probably have been conducted by J2a1 lineages, a subclade that is virtually absent outside Europe today, although J1c cannot be excluded yet. The highest frequencies of J2a1 are found in northern Germany and Denmark (5%), Switzerland (3%) and England (2%). J1c being so rare in the Middle East today, it can be envisaged that it was a lineage of hunter-gatherers who inhabited the Eastern Mediterranean and southern Balkans during the Epipaleolithic, but that its diffusion across the rest of Europe did not take place until the Neolithic period. The paternal haplogroups originally corresponding to J1c and J2a1 might have been E-V13 and J2b, two lineages thought to have evolved in Southeast Europe in the Late Glacial and immediate postglacial periods. Contacts between tribes of European hunter-gatherers would have allowed J1c and J2a1 lineages to join Y-haplogroups I1, I2 and R1a already before the Neolithic. Samples have been identified from various Neolithic sites, including Linear Pottery culture (LBK) in Central Europe, the Cardium Pottery culture in southern France, Megalithic cultures in northern Spain, and the Funnelbeaker culture in Germany and Sweden. All Neolithic samples tested to date belonged to J1*, J1c or J2b1a. J1c is by far the most common form of mtDNA J in Europe today, making up over three quarters of all J lineages. One question that follows is: did J1c and J2b1a lineages actually come from the Near East during the Neolithic, or whether they were already in the Balkans and just expanded from there ? Both being rare in the Near East today, the second hypothesis might seem more convincing at first. However, the age of J2b1a has been estimated at 11,000 years before present, while the Neolithic started over 12,000 years ago in the Near East. In other words, it could have arrived from the Near East as J2b1* and developed into J2b1a only after reaching Europe, which would explain why this particular subclade is almost exclusively European while all other subclades of J2b1 are mostly Middle Eastern or the eastern Mediterranean. J2b1a would therefore have come as a maternal lineage of early agriculturalists alongside the paternal lineage G2a (and perhaps also E1b1b and T1a). J1c, however, is too old (15,000 years) for that scenario. If it had been part of the Neolithic expansion from the Fertile Crescent, many J1c subclades would be primarily West Asian today, which isn't the case. The only J1c individuals outside Europe belong to deep clades that clearly originated in Europe or in Anatolia. Mathieson et al. (2015) tested the DNA of Early Neolithic farmers from western Anatolia and and from the Starcevo culture in Hungary and Croatia, and found that J1c was present in both cultures, alongside other typical European Neolithic lineages like H5, K1a, N1a, T2 and X2. Lazaridis et al. (2016) tested 44 ancient Near Eastern samples, including Neolithic farmers from Jordan and western Iran, and well as Chalcolithic and Bronze Age samples from Armenia and the Levant, but did not find any J1c, apart from a single sample in Neolithic Iran. This suggests that J1c lineages were probably not found among the very first farmers of the Fertile Crescent, but was rather assimilated in neighbouring populations further north, notably in Anatolia and Iran, but probably also in the Balkans, which were connected to Anatolia by a land bridge during the glacial and immediate post-glacial periods. Haplogroup J has been found in Bronze Age samples from the Yamna culture (J2b), Corded Ware culture (J1c and J2b1a), the Catacomb culture (J1b1a1), the Unetice culture (J1b1a1), and the Urnfield culture (J1b1), all in Central Europe. The Corded Ware culture is associated with the expansion of Y-haplogroup R1a from the northern Russian steppe, and in light of the continuity with Neolithic samples from Central Europe it can be assumed that J1c and J2b1a maternal lineages were not brought by the newcomers, but absorbed by the male invaders. On the other hand, J1b has never been found in Europe before the Bronze Age and was very probably brought by the Indo-Europeans carrying R1b paternal lineages. Both the Unetice and the Urnfield cultures are thought to have been founded mainly by R1b men. J1b has also been found among African tribes carrying R1b-V88 lineages, which would presume that J1b was one of the original maternal lineages found in R1b populations at least since the Early Neolithic (see R1b history). The absence of J1b in Bronze Age sites associated with the expansion of the R1a branches of the Indo-Europeans (Balto-Slavic and Indo-Iranian) supports that European J1b is exclusively associated with ancient R1b populations. J1b is also very common among non-R1b populations in the Middle East (notably the South Caucasus, Iran and the Arabian peninsula), although the subclades are different. The most common J1b subclade in Europe, and the one most strongly associated with Y-haplogroup R1b, is J1b1, and particularly J1b1a in Europe, which also happen to be the subclade identified in the Urnfield culture. Other subclades of J1b are restricted to the Middle East or the eastern Mediterranean. The highest frequencies of J1b1a in Europe are consistantly observed the regions with high percentages of Y-haplogroup R1b, such as Iceland (5.5%), Scotland (3.5%), Wales (3.5%), and south-west France (2.5%). The Kalash of northern Pakistan, who occasionally have blond hair and blue eyes, are another interesting case. According to Quintana-Murci et al. (2004), their maternal haplogroups are 100% Western Eurasian and include typically Indo-European lineages like H2a1 (2%), U2e (16%) and U4 (34%), all three linked to Y-haplogroup R1a, but possess also 11% of J2b1a, a lineage typically found in Russia and western Europe, but absent from or rare in the Near East (see above). Based on J2b1a's presence mostly in western Europe, the natural association would be with R1b. However, the Kalash have 18% of R1a, but no R1b (although they do have remnants of very old R* and R1*, which makes them very special). This means that J2b1a1 could have spread by either R1a or R1b Indo-Europeans, or both. Typically European J1c subclades occasionally have deep clades found in West Asia, South Asia, Central Asia or North Asia. In most cases those subclades would have been spread outside Europe by the Indo-European migrations. Among potential candiates are J1c1 (found in Uzbekistan), J1c2a5 (found in the Canaries, among Volga Tatars and in Siberia), J1c2m (found in Turkmenistan, Siberia and Romania), J1c3e1 (found in Turkey), J1c3f (found in the North Caucasus and Kazakhstan), J1c4 (found in Siberia), J1c5 (found in India and among the Yakuts of Siberia), J1c7 (found in Armenia and Kuwait), J1c8 (found in India), J1c12a and J1c12b (found in Iraq and Azerbaijan). All of them are also found both in western and eastern Europe. Unfortunately, data for deep J subclades from Central and South Asia is still sparse at the moment and it is hard to confirm this with certainty. It is also possible that these J1c subclades were propagated by Neolithic herders from the Zagros and Caucasus, including those belonging to the Y-haplogroups J2a and T1a, who would have been the neighbours of R1b cattle herders during the early Neolithic. J1b (except J1b1), J1d, J2a2, J2b1b and J2b2 are rare in Europe and essentially confined to the Middle East. J2a2 is also common in north-western Africa (J2a2b and J2a2d). J1d and J1b subclades other than J1b1 are found all around the Middle East and the Caucasus and expands towards Mediterranean Europe to the west and Iran to the east. J1d4 has even been found among Indian Brahmins. The distribution of mt-haplogroups J1b and J1d are reminiscent of those of Y-haplogroup J1 and J2 (mtDNA J1d being closer to Y-DNA J2). According to González et al. (2012), haplogroup J appears to be protective against diabetes. Coskun et al. (2004) studied the mutations that suppress mitochondrial transcription and replication and reported that haplogroup J could be protective against Alzheimer's Disease (AD). The A10398G mutation defining haplogroup J (a back mutation from macrohaplogroup N) has been associated with increased longevity (Dato et al. (2005), Shlush et al. (2008) and Nijiati et al. (2013)) and protection against PD (Ghezzi et al. (2005) and Clark et al. (2011)). It is found in all members of haplogroup J except J1c8. The common C150T mutation has been found at strikingly higher frequency among Chinese and Italian centenarians and may be advantageous for longevity and resistance to stress according to Chen et al. (2012). C150T defines haplogroups J1b7, J1c1c and J2, but may also be found among other subclades. Hendrickson et al. (2008) studied the role played by mitochondrial function in AIDS progression in HIV-1 infected persons. They found that AIDS progression was faster for members of haplogroups J and U5a. Martínez-Redondo et al. (2010) found that haplogroup J was associated with a lower maximal oxygen uptake (VO2 max) compared to other haplogroups. Another study by Marcuello et al. (2008) also reported that members of haplogroup J had lower VO2 max, as well as lower efficiency of electron transport chain (ETC), diminished ATP and ROS production. This would imply that members of haplogroup J have a reduced physical endurance during prolonged exercise. David Caramelli and his team tested the supposed remains of Petrarch (1304-1374), the famous humanist, scholar and poet from the Early Italian Renaissance. They managed to identify his maternal haplogroup as J2. On 12 September 2012, archeologists from the University of Leicester announced that they had discovered what they believed were the remains of King Richard III of England (1452-1485) within the former Greyfriars Friary Church in the city of Leicester (see Exhumation of Richard III). The skeleton's DNA matched exactly the mitochondiral haplogroup (J1c2c) of modern matrilineal descendants of Anne of York, Richard's elder sister, confirming the identity of the medieval king. Edward IV of England (1442-1483) was Richard III's elder brother and predecessor as King of England. Having the same mother, Cecily Neville, Duchess of York, both kings would have shared the same mtDNA haplogroup. Esther Hochman Wojcicki (subclade J1c): an American journalist, educator, and vice chair of the Creative Commons board of directors. Anne Wojcicki (subclade J1c): an American biotech analyst, biologist, and businesswoman. As a businesswoman, she is the co-founder and chief executive officer of 23andMe. She is the daughter of Esther Wojcicki, and is married to Sergey Brin, co-founder of Google. Mario Batali (subclade J1b3a): an American chef, writer, restaurateur and media personality. He is an expert on the history and culture of Italian cuisine, including regional and local variations. His haplogroup was revealved in Faces of America. Ximena Navarrete : a Mexican model, actress and beauty pageant titleholder who won Miss Universe 2010.